This is a test, of sorts. Below is the first of about 175 photographic montages constructed for an Illustrated History of the Seattle Waterfront that I wrote first in 2005 on request from the Seattle City Council. It took about 5 months to complete, and I forsook Ivar (except for including him and his in the history – even this introduction!) and much else – except the weekly Timesfeatures – in order to get it done. When figured by the hour, I was paid considerably less than the minimum wage, a progressive anticipation of the recession-depression we are rolling into. Yes, I was on the cutting edge of cut backs. Still it was a great delight to write this history – or to assemble it from many years of writing on Waterfront subjects and to also use other resources I had not yet studied. In the spring of 1944 the military changed the name (or letter or number, for all were variously used) of every pier on Elliott Bay. Although a new system was first studied by a committee of all concerned — the shippers, the Port of Seattle, and the military — it was the warriors who at last took charge and decided that from then on it would be numbers only. 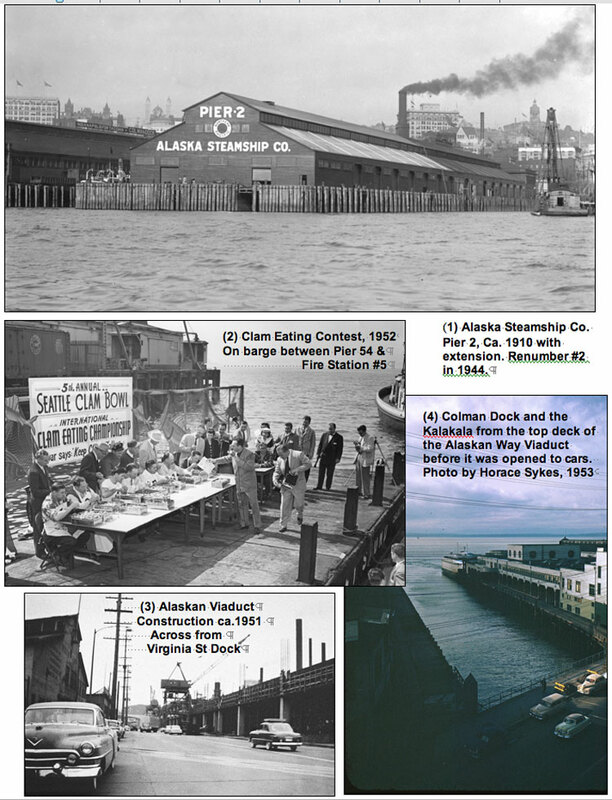 Appreciably the principal resistance to the military’s new unified scheme came from the Alaska Steamship Company at Piers 1 and 2 (in the old system). The distinguished shipper explained that it had been advertising its cherished numbers “all over the country for many years,” and that losing them would be a hardship. While the generals were not impressed and cited many examples of how the old system was both confounding and potentially dangerous, the greatest confusion had been of the army’s own making. When it first took charge of the Port of Seattle’s tideland docks south of Dearborn Street for its Port of Embarkation the army lettered the piers there A, B, and C. As just noted, these were the same letters then already used for 40 years at the Pacific Coast Co. piers directly south of Yesler Way. In one week during the war someone in security counted 24 trucks and 27 individuals calling at a private dock when they intended to visit a military one of the same letter. They might have known better, for the truth was, as the generals explained, during the war practically all of the activity on the waterfront was military. There was, it seemed, “no private shipping.” It may well have been this “A, B, and C” confusion that inspired the military to rationalize the entire “pierage” on Elliott Bay into numbers only. It was probably the military’s Seattle Port Security Force that turned the truckers from their blunders. After a three-week course at the University of Washington the volunteers served 12 hours weekly – without pay. Their duty? “To patrol the waterfront, board vessels, check for subversive activities, watch for fires and aid in keeping the waterfront safe, clean and presentable.” At the time this meant “clean of fascists.” In 1950 it would mean “clean of communists” as the Coast Guard reinstated the requirement for security passes. Rear Admiral R. T McElligott was resolute. To the fifteen Pacific Northwest unions who objected to the new security regime he explained that anyone without a card would be kept off the waterfront, and that identification cards issued during the Second World War were no longer valid. Most importantly, perhaps, this new cold war cardboard was devised as a badge of loyalty. During both the hot and cold wars there was plenty to be anxious about anywhere including the waterfront. But immediately following World War Two, there was little concern for security and loyalty but plenty of puzzlement over what to do. While the Port of Seattle maneuvered to get its piers back from the military it also lobbied for certification of a World Trade Center on the East Waterway. And it wanted big changes on the central waterfront. The Port publicly pictured for maritime reporters (when there was still a regular waterfront beat in the local dailies) a waterfront whose protruding finger wharves were traded for a long quay that paralleled Alaskan Way. The new ships were expected to be much too long for the old piers that could not at any rate be extended far enough off shore to service them because the water was too deep there to sink piles. As late as 1949 the military’s Seattle Port of Embarkation, which the Port and the Army partnered to build during the war, was still the largest ship operator on the waterfront. Otherwise the old waterfront was rusting and splintering, although the tax-supported Port of Seattle watched and waited to purchase large pieces of it at good prices. It was also in these post-war years that the vanguards of the central waterfront’s future in play and recreation – notably Ivar Haglund – first enlivened it with antics like clam eating contests. In 1950 they also illuminated it. On the sixteenth of March, 1950 at 6:15 P.M. between Bay Street and Yesler Way the new mercury vapor lights were turned on, giving the waterfront what Ivar described as a properly “romantic green tinge” for St. Partick’s Day. Here we will briefly stand below the Alaskan Way Viaduct and note that its construction was made easier by the relative torpor and uncertainties (if not the petty theft) on the waterfront during the post-war period. Since the mid-1920s when local motor traffic first started to periodically lock up Seattle streets – or rather its avenues, for the problem then as now was primarily one of moving north and south through the wasp-waist city – the waterfront was coveted as potentially the great detour – the best way to go around the business district. (As first built, the Alaska Way Viaduct completely avoided downtown. The access ramps at Seneca and Columbia to and from the business district were not added until the early 1960s.) A double-decked elevated roadway was imagined from the beginning. During the Second World War buildings along the way were condemned and purchased and, with the general maritime depression that followed the war, the waterfront had really no one to defend it against this vision of it as a convenient detour. While the elevated had nothing to do with water and so with the waterfront, it was by then soaring with advocates. While it was being lifted above the relatively new and loose land that had been packed between the seawall and the “native land” (South of University Street the old waterfront meander line generally runs a few yards west of First Avenue, between it and Post Alley), the monumental Viaduct seemed to many an encouraging sign for the neighborhood of wharves and commission houses. Something was being done. Consequently, although Pier owners and patrons were inconvenienced, they generally put their own best construction on the building of the “great gray way” and smelled in the curing concrete a sweet new waterfront bouquet. Before the viaduct was opened to traffic three days following April Fools Day, 1953, a few pedestrians with connections and cameras were allowed to use it as a prospect for studying the city. They came 101 years after Arthur Denny and William Bell first tested it from off shore as a proper site for building a port community. Unlike the Port of Seattle planners who were proposing parallel piers in 1946, the founders were encouraged by the deep water and marked their upland claims beside it. But the viaduct explorers of 1953 would have been burdened with more than their cameras to find any evidence of the native waterfront from the viaduct without getting off of it and digging or drilling for it through the strata of a century of city building. Like the motorists that soon followed them onto the viaduct, the camera bugs favored facing the city. The few surviving photographs that turn from the tall buildings to look down on the piers are Kodachrome confessions of the waterfront as worn and worried, its common condition in 1953. Still, there were prophetic exceptions, most notably at Pier 54 where Ivar’s Acres of Clams was already a popular destination.